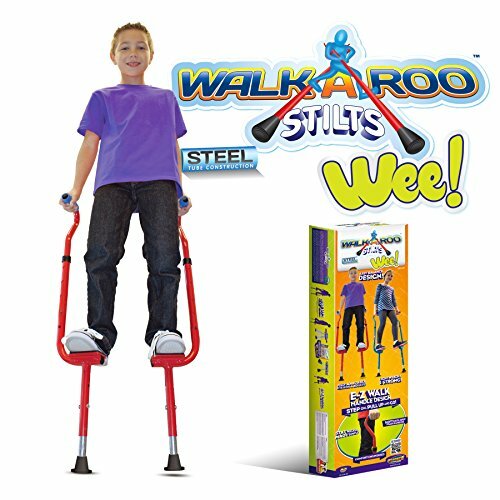 Now even younger kids get to stand tall thanks to Walkaroo Wee! Stilts are great for improving balance and coordination. But best of all they bring joy and delight to everyone who steps on! WEE Balance Stilts are made of rugged tubular steel just like the standard Walkaroo steel stilts for big kids and adults. But these are designed and engineered for small tykes as young and short as a 3 year old. And these stilts also adjust as kids grow taller and are ready for our standard Walkaroo Stilts (#11110 or #11112). Special foot design makes easy balance movement possible as well as adjusts from 10 to 15 inches off the ground. Recommended for Ages 4 & Up. E-Z Walk Handle design makes stilt-walking simple to learn, just step on, pull up and go!